I have to admit I was worried that the decision could go against the TMT project. Earlier today hearing officer Judge Ricky May Amano recommended that the TMT project be granted a Conservation District Use Permit or CDUP. The decision is nearly three hundred pages long, none of us has had a chance to do more than skim some of the more interesting sections. Indeed most of us opened the document and skipped straight to page 260 to read the Recommended Decision and Order first. What I have read appears to be a straightforward reading of the law involving land use. Yes, it is a conservation district, that means that there shall be sufficient management of the project, but does not mean that the project cannot proceed. We have yet to see the outrage from TMT project opponents. I expect it will be shortly forthcoming and quite vehement. Where do we go from here? As I understand it the next step is for the DLNR board to vote on the acceptance of the hearing officer’s recommendation and reissue the permit. Of course the next thing to happen after that is the inevitable court challenge. This will go straight to the state supreme court as recent legislation set that as the path for land use cases, skipping the lower courts. As the TMT contested case drags on we continue to watch. Thanks to the efforts of the staff of Nā Leo TV the entire proceedings are streamed live. Several of the latest witnesses for the University are Hawaiian supporters of the telescope project, it is these voices that I am most interested in hearing. Author AndrewPosted on December 5, 2016 December 2, 2016 Categories Comment, Mauna KeaTags contested case, DLNR, Mauna Kea, telescope, TMT1 Comment on Hawaiian Enough? We have been through weeks of the TMT permit contested case hearings at this point, with no end in sight. I have often kept the live feed in the corner of my computer screen through the day. Many of the petitioner’s efforts are well prepared and professional, particularly those from Mauna Kea Anaina Hou. Other are less so, to be expected when the participants are not experienced in legal proceedings. Other petitioners seem unable or unwilling to understand repeated instructions from the hearing officer. At least most of the grandstanding has settled down as it became apparent that it would not be tolerated in the hearing room and that Judge Amano would evict those who repeatedly disrupted proceedings. I have not had a chance to attend any of the contested case meetings, they are taking place in Hilo on workdays. Following along by reading all of the court documents is almost as good, maybe better. Big Island Video news has also posted quite a few videos of the proceedings where you can watch and get a feel for the tone and process of the hearings. All of the filings are available online, posted to the DLNR website. There are now over two hundred filings, with at least a few added almost every day. They detail the legal maneuverings of all of the parties as they make claims and counterclaims over every issue in the case. It is clear that the telescope opponents have a couple basic strategies, neither of which address the issues. First is simply to delay and obstruct. Every decision is appealed and contested, from who is party to the case, to the selection of the hearing officer herself. Attempts to limit the discussion to the issue at hand have been vigorously contested by those who have other agendas. One observation is that witness lists of telescope opponents are extensive, 39 persons on the Mauna Kea Anaina Hou (Doc-103 and Doc-104) list alone. To be fair, many of the the opponents do only have a few witnesses to call, but the sheer number of participants makes the resulting numbers a bit excessive. Reading through the various lists I fail to see where each witness will bring unique testimony to the case. In contrast the University and other supporters have very brief witness lists with only a handful of witnesses requested. Certain names do stand out… Dr. Sai, a well known sovereignty proponent. UH Chancellor David Lassner is present. Even Governor Ige has been listed, a request that is already subject to extensive legal wrangling. A common theme in both the hearing room behavior and in the document opponents claim that they have been subject to personal attacks or harassment. Claims are made that they are “under duress” despite the fact that participation in this proceeding is entirely voluntary. Judge Amano has gone out of her way to explain methods by which opponents could participate in the hearings without being full parties in the process and subject to the associated paperwork and attendance burdens. Friday night the Board of Land and Natural Resources approved rules restricting access to Mauna Kea. 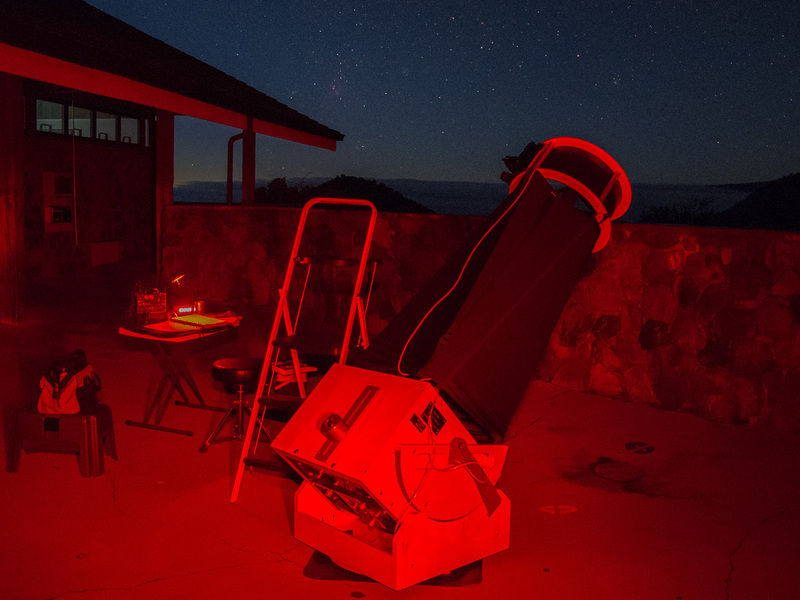 My 18″ telescope Deep violet set up under the stars at the MKVIS. There have been some revisions to the rules as originally proposed. Most notably the closure hours begin at 10pm in place of 8pm, this would allow the VIS to operate the normal evening public program. I have yet to locate a copy of the final approved rules, it is only a few minutes ago that the decision was approved. I expect they will appear on the DLNR website eventually (Tonight? Monday?). They are effective immediately, I would expect there to be a legal requirement to post them. It is safe to say that there will be no overnight observing at or near the Mauna Kea VIS. You will need to find a site elsewhere or at least one mile from the access road. These rules are effective for 120 days, after which we will see what happens. In that time they may be allowed to lapse. It also allows the DLNR time to approve similar, permanent rules through the regular process in place of these emergency rules. 120 days and counting… I make that November 8th, 2015. (a) The area referred to in this rule as the “restricted area” is defined as any lands in the public hunting area that includes the Mauna Kea Observatory Access Road and one mile on either side of the Mauna Kea Observatory Access road. (b) As used in this rule, the term “transiting” means operating, or being a passenger in, a motor vehicle traveling at a reasonable and prudent speed and having regard to the actual and potential hazards and conditions then existing. An End to Observing at the MKVIS? As we are all aware, the TMT protests are having direct consequences for everyone who goes to the mountain. Regular mountain users and tourists alike are dealing these consequences. The summit road closed to the public for a second week, the MKVIS also closed, even before these closures the protests had curtailed many activities. It looks to get worse. An agenda item that will appear before this week’s DLNR board meeting contains significant rule changes regarding use of the lands surrounding the Mauna Kea access road. For the local amateur astronomy community this looks to be very serious, a complete closure of a place we have all come to value very highly. Go the the Mauna Kea Visitor Information Station on the weekends nearest new Moon and you will find telescopes. While the MKVIS telescopes get put away at 10pm there are ‘scopes that are operating late into the night, often still there when dawn colors the sky. These telescopes belong to local amateur astronomers who bring them here to enjoy perfect Mauna Kea skies. Author AndrewPosted on July 7, 2015 July 6, 2015 Categories Mauna Kea, Observing SitesTags DLNR, Mauna Kea, MKSS, MKVIS, observing4 Comments on An End to Observing at the MKVIS?